When non-Buddhist chaplains encounter a Buddhist patient or family, they often have questions on how exactly to minister to them. Is Buddhism a religion or philosophy? Does Buddhism believe in a God or not? What part does worship, faith or prayer play? How is end of life approached? This 90-minute webinar will offer a clear snapshot into the world of Buddhism - its thought, traditions and practices. Participants will learn to identify the differences among the various schools, set up a Buddhist altar and use meditation or chanting to effectively pastor their patients. 1. Discern which school of Buddhism their patient is practicing and how it differs from other schools of Buddhism. 2. Provide better chaplaincy care to individuals and families who identify as Buddhist. 3. Share with their chaplain colleagues information on ministering to Buddhists. Seigan Ed Glassing studied drawing at Pratt Institute and became interested in Buddhism through studying mandalas. He began formal Zen practice in 1985 at the Zen Studies Society while in college, and lived and practiced at their Catskill Monastery from 1987 to 1995. He was ordained a Zen Buddhist monk in 1991, and his spiritual journey eventually took him to Japan where he practiced at Shogen-ji, a Zen monastery near Nagoya. 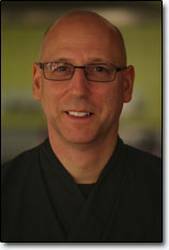 For 10 years, he was the co-director at New York Zendo Shobo-ji in New York, teaching meditation, giving talks and assisting in retreats. Seeking a more engaged Buddhism, one that would bring him outside of the monastic setting, he began training as a Buddhist chaplain with the New York Zen Center for Contemplative Care. He interned at the VNS hospice and at Beth Israel in the ICU. He completed his clinical pastoral education (CPE) with the Pastoral Care Department at New York Presbyterian Hospital, where he was hired as staff chaplain. To participate, all that is needed is a computer with Internet access and speakers, as the presentation audio and visuals are "webcast." Our webinars are priced per computer terminal, not per participant. That means you can invite as many colleagues to join you as can fit in your conference room or cluster around your computer. As a participant, you will be able to interact with the presenter, who will ask questions of the audience and answer questions posed by participants.